George Graham Reviews The String Cheese Incident's "Outside Inside"
One of the more encouraging developments in contemporary music is the return of the jam band. In the period leading up the death of Jerry Garcia, the Grateful Dead found a whole new generation of fans for their extended improvisational performances. Then the band Phish more or less stepped into the Dead's footsteps among many enthusiasts, and helped pave the way for a good number of jam bands to follow, some outstanding, and many less so. 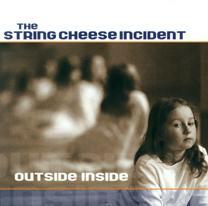 By my way of thinking, one of the two best jam bands currently on the scene is The String Cheese Incident. Based in Colorado, The String Cheese Incident was founded in 1993 in a ski resort town, but they later moved to Boulder. They have been steadily winning fans through their constant touring. Taking a cue from the Grateful Dead, whose fans would follow them along on their tour, the String Cheese Incident formed their own travel agency to accommodate their fans, and further maintain their own independence through their operating their own record label. The quintet have established a reputation for their spirited live performances marked as much by their eclecticism as their level of musicianship. A String Cheese performance could start out sounding bluegrass and then turn toward the salsa then become bluesy. While none of the players are really flashy virtuosos, they have really mastered the art of the jam, keeping the musical energy and interest going during their solos, while also performing some tighter arrangements. Like all good jam bands, the String Cheese Incident is best live. Their double live CD from a just about a year ago, Carnival 99, was the epitome of what a jam band could do, with over two hours of great, nearly non-stop music. But this time, the band takes a different direction. They went into the studio with a producer to create their new release called Outside Inside. Recently I did an interview with Butch Trucks, drummer with one of the great jam bands of all time, the Allman Brothers, and founder of my other pick for best current jam band, Frogwings. Trucks said that he would never go into a studio with Frogwings. He would insist that any album releases would be recorded live. He even said he never liked the Allman Brothers' studio albums. That seems to be good advice for jam bands with the musical chops to pull off a polished live recording. So after The String Cheese Incident's spectacular live albums, the idea of a studio recording with a producer with a pop music background leaves fans wondering, perhaps with some concern, what the result would be. Outside Inside turns out to be an interesting and generally worthwhile album that would be considered very good, if it had not been released in the wake of the band's live recordings. It's very much more restrained musically, and mostly song-oriented. Producer Steve Berlin of Los Lobos does a respectable job in capturing some of the spirit of the band, who do get a chance to put in one ten-minute long track, but the energy level is definitely inhibited and the group almost sounds as if they are trying to break out of the strictures of the four or five minute song. This is not to say that the String Cheese Incident has gone commercial on Outside Inside, but they clearly have opted to take a different direction this time, which they may have viewed as a challenge. The group's personnel remains the same with Kyle Hollingsworth on keyboards, Bill Nershi on acoustic guitar, Michael Kang on electric and acoustic mandolin as well as fiddle, bassist Keith Moseley and drummer/percussionist Michael Travis. In this setting, it's interesting to hear the difference in the writing contributions from the various members, and the somewhat different approaches the group takes on each tune. The studio setting also gives the group a chance to be joined by some supplemental musicians, such as the unnamed horn players that appear of the CD. While jam bands are not exactly known for their lyric writing skills, there are a couple of tracks on Outside Inside that defy expectations and turn out to be fairly articulate. The String Cheese Incident is one of the finest of the current generation of jam bands. So their new studio album Outside Inside is something of a surprise, with its much more restrained, tightly structured sound. Perhaps the group looked at this as a challenge, after creating a pair of excellent live albums, to show their versatility and to set off some more lyric-oriented music, and perhaps they were looking to expand their audience a bit beyond the dedicated jam band fan. For what ever combination of reasons, the new CD is a considerable departure from their previous live album, and that may or may not sit well with the group's growing following. Still, from an objective musical standpoint, ignoring the group's history, Outside Inside is a very good album, with an eclectic potpourri of styles, and first-rate musicianship. Our sound quality grade for the CD is about an A-minus. The mix is well-handled and generally tastefully restrained with the studio effects, but the recording is lacking much in dynamic range, with not a lot of difference between the loud and soft passages. Great jam bands can sometimes suffer when recording in the sterile environment of the studio. The String Cheese Incident's new CD, while it does not reach the heights of their previous live albums, does represent another facet from a versatile and resourceful band.